Check out The Domestic Front: Lest We Forget sculpture at 425 Kent St this month. "IN AN era of past conflict, unimaginable human sacrifice has been called upon to meet and overcome the challenges and demands of war," said Deborah Hannam about one of the Maryborough Mural Project's controversial installations. 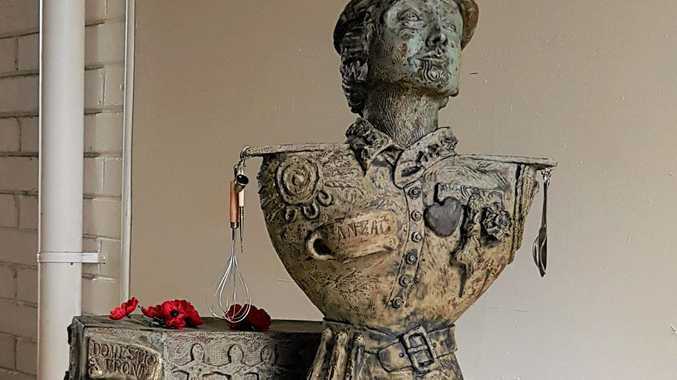 "This sculpture, called The Domestic Front: Lest We Forget is intended to remind us all of the tremendous fortitude, commitment and support provided by Australian women domestically during the war years. "Steeped in symbology, the piece is for public viewing in Old Town Hall Arcade, entry from 425 Kent St. Opening times are 9-5 weekdays," said Elizabeth Lowrie, the project's co-founder. "Much art is controversial, and this piece certainly is. It was created for the Anzac Centenary in 2016. "It's deceptive, and only when you get up close do you understand how intricate and thought- provoking the symbology in the piece really is. "MMP loved it so much we bought it from the sculptor to add to our Trail in June last year. "We just forgot to tell everyone about it in our rush to have the Trail up and running!" Sculptor Lisa Baier says she has been "potty" since 1998 when she attended a night course in ceramics. Her main focus has been on symbolic sculpture and altered tableware to represent both imperfection and individuality. As a community-minded person, Lisa has participated in the Benalla Ceramic Mural Project in Victoria and facilitated a totemic installation in Cooma, NSW which personified the "sisterhood" between Yamaha City in Japan and Cooma. To date, Lisa continues to produce both distinctive hand-built sculptures and individualised tableware while promoting more community endeavours with a collective group of local artists. See this thought-provoking sculpture as part of the Maryborough Mural Project Trail, which is comprised of over 30 murals and installations - an easy two-kilometre walk around Maryborough's CBD. Drop into the Town Hall Visitor's Centre for a self-guided map. Map pads for venues to hand out to visitors are available from Fraser Coast Opportunities and Events. If you like what MMP does, be a volunteer or send your donation to: Maryborough Mural Project. C/- BOQ: BSB:124080; Account No: 22621596.